I've always wanted to watch that movie where the legless crackshot midget straps himself to a fleet-footed armless midget so that together, they become the ultimate gunfighter-- but I never thought I'd have to shrink down to miniature form myself, to finally check it out. 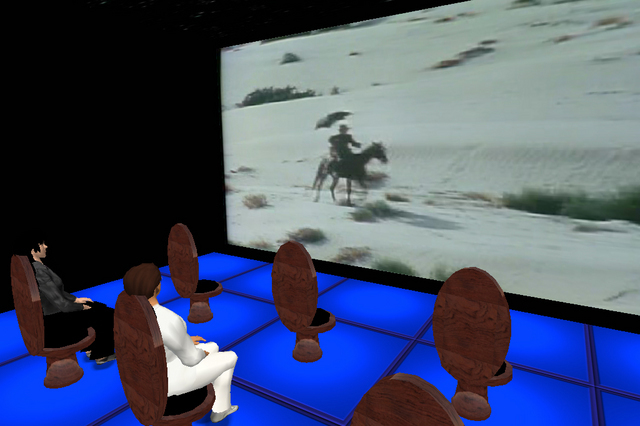 El Topo, the ultimate 70's cult film, Alejandro Jodorowsky's meditation on God, death, and one man's quest for meaning in a savage world, is now being streamed for free viewing in a tiny theater on the North side of Garmisch, just off the highway past the Lookers NightClub & Casino. "I previewed it a week ago and totally blew about ten [Residents away]," theater owner Alex Ludovico tells me proudly, laughing. "[P]eople were floored. One girl said she would be thinking about it for days." A projectionist in real life, Ludovico is also a film archivist in his spare time, tracking down the subversive and obscure since 1989, "the year I first got a VHS of El Topo, and went from there... it's not really a business, more a hobby, labor of love. Same with my [Second Life] theatres. I like to run them just for the fun of it. And I'm curious to what people will make of [Jodorowsky's films]." Like an in-world Tarantino (who recently purchased a decrepit Los Angeles theater so he could have free screenings from his 16mm vault for friends) Ludovico streams his archive of hard-to-find films for the sheer joy of sharing them. "[C]ult stuff like El Topo might get a reputation if a few people see it and spread it around," he says. To do this, he pays a hosting service about 8 bucks a month to stream 120 gigs worth of video onto his property. "Average film, say ten people watch, takes maybe five gigs." Ludovico came to Second Life before it was possible to stream Quicktime video in-world, and even then, his creativity had a cinematic bent. One of the first projects he showed me back then was inspired by the Korova milkbar from A Clockwork Orange, but he gave that one up when another Droogie entered the Kubrick tribute fray. "[S]ome girl bested me on it," he tells me. "She has one that has like statues and everything, just humbled me." 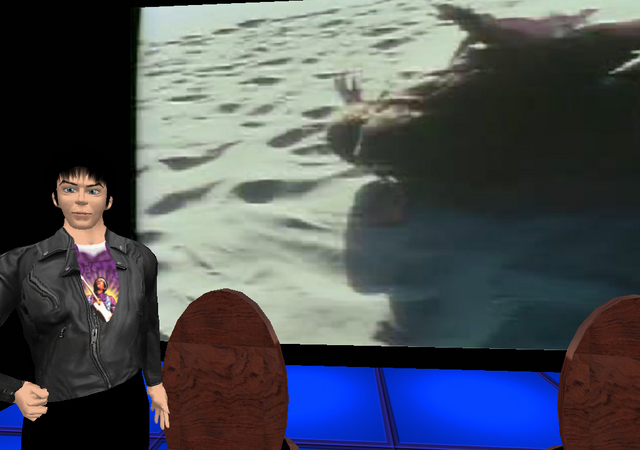 So now his efforts are focused on streaming the actual films into Second Life. "I always wanted a virtual movie theatre, now I have four. 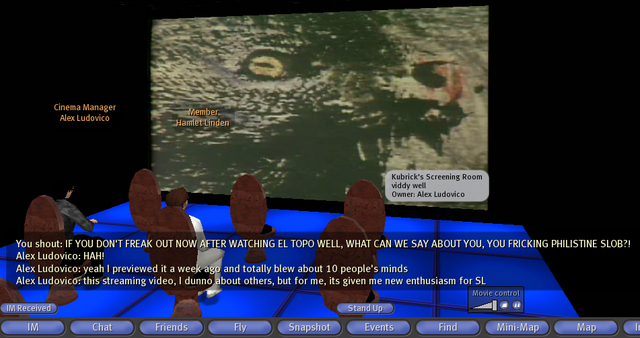 I should show you my sky cinema-- it's kinda based on Jodorowsky's second film, Holy Mountain. I bought a mountain peak and built an outdoor cinema on it." Depending on how many people line up for El Topo, he may bring the original incarnation here, too. "I'll show Holy Mountain next if this one gets a response," he says. I should add: my sarcastic comment in the 2nd screenshot is directed at the *trailer* to *El Topo* that Ludovico and I are watching in the pic. Like many arthouse trailers from the 70s, its voiceover sort of, um, oversells the movie. LOL. Now *that's* value added. Hahaha... there's a lot of inworld craziness you express that doesn't quite make it into NWN on a regular basis, so it's *very* nice to HEAR YOU SAY THAT! The communal entertainment experience is a powerful one. Movies just aren't the same when you're alone, alas. Cool to hear about Alejandro sharing his love for what might otherwise go undiscovered... I have fond memories from the early 90s of watching the shaky, detuned videos of the Canadian film boards... polar bears walking towards the screen in the tundra made more grainy by the poor image quality, and the warbling of beavers-marrying-scanlines building their dams.